WarStuffs Addon contains some military things without which it is impossible to fight. You will have access to the full inventory of an ordinary soldier, namely you will receive a military uniform, a rifle, a pistol, explosives and ammo. Using this set any opponent will be defeated. 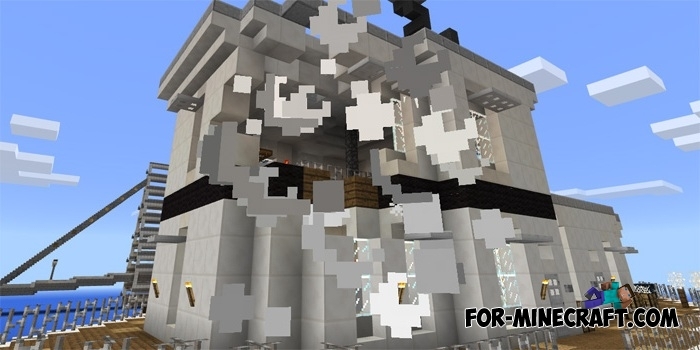 In addition to skirmishes with mobs, it is possible to play a multiplayer mode of MinecraftPE where players can organize capture the flag and checkpoints games, or deathmatch. Such addons are perfectly combined with maps such as arenas, military bases and forts. All weapons cause the same damage as a sword, a bow and arrows. If you want to shoot from a large set of weapons or use night vision goggles then you should download the DesnoGun mod. The WarStuffs Addon is much smaller than the mod, but it's easy to install and does not cause lag.